Haig Point Club, Daufuskie Island SC will host its second annual Patriot Golf Day, benefiting the Folds of Honor Foundation, on Mon., Oct. 29. 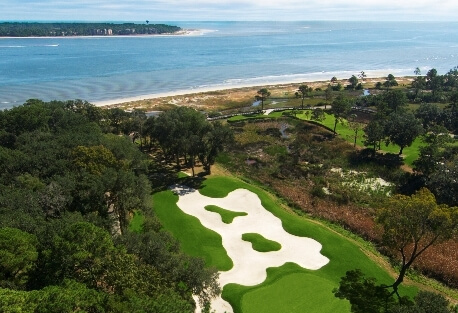 Today's golf & waterview community news includes exciting award and ranking designations for Sea Pines Resort and Callawassie Island Club in South Carolina. Harbour Ridge Yacht & CC, Stuart FL invites you to visit for lunch, a day or longer! Enjoy 2 golf courses, yacht club, marina, tennis, pool, dog park, more! The private, master-planned community of Woodside in Aiken, SC, continues to buttress its commitment to golf with the construction of a new 18 called Hollow Creek which will further add to its rich mix of activities and amenities for families. Completion is set for next year. Golf legend Jack Nicklaus was at The Club at Ibis on Wednesday to officially reopen the aptly-named Legend Course in front of more than 400 members. Nicklaus built the course in 1991 and his renovation featured the changes in golf and Nicklaus’ design philosophy during the last quarter century. Quail Ridge Golf & Country Club, Boynton Beach FL is hosting an open house tour of four Quail Ridge properties on November 16, from 10am to noon. Maps will be available in the business center, real estate office, and security gates. Quail Ridge is also looking forward to welcoming winter visitors to the new clubhouse and Grille. Youth on Course (YOC) is holding an online auction Nov. 12-16. To match its growth in 2017, the Youth on Course auction aims to raise $150,000, a $55,000 increase from 2016. All proceeds go directly to supporting Youth on Course’s commitment to providing today’s youth with life-changing opportunities through golf. Sea Pines Resort, Hilton Head Island SC recently announced its latest “Getaway Package” for fall and winter getaways through March 2, 2018. The offer starts at $127.50 a night for three nights in a two-bedroom deluxe villa as well as up to 15 percent off already reduced nightly and weekly rates for homes and villas.